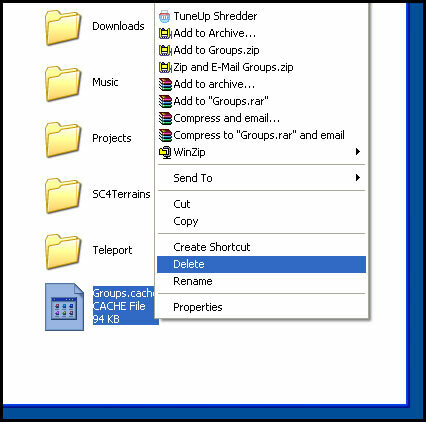 This article explains how to remove temporary cache files created by the game. If those cache files become corrupted, or have grown too large, it can cause problems. Sims 2 or Body Shop being slow to close. Body Shop, Sims 2, or Homecrafter never starting when you attempt to run them. Body Shop, Sims 2, or Homecrafter crashing while loading. Deleting cache files is perfectly safe. The game will generally generate fresh new ones when you load it the next time. Go to My Documents \ EA Games \ The Sims 2 and delete the groups.cache temporary file. See [this page] for more info on exactly what groups.cache does. These two files may be present in your My Documents \ EA Games \ The Sims 2 folder as well. If they are, they can be deleted as above. You may go into the My Documents \ EA Games \ The Sims 2 folder and find that not all of the files mentioned above are present. That's okay, and generally does not mean there is a problem. 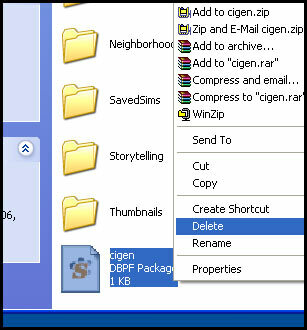 Just delete the ones you have. If you are experiencing shredded, corrupt, blurry, or otherwise incorrect thumbnails, you can delete the contents of the Thumbnails folder safely. You may experience a bit of lag when you browse through your content at first after doing so - Sims 2 or Body Shop will need to regenerate new thumbnails for everything. Try a System Checkup to make sure your computer is running at peak efficiency. Clean up old projects as described on Game Help:Body Shop, and clean up and organize your custom content. Generally, the less content you have, the quicker the everything will close. If you are getting actual error messages, try looking for more information on your specific error. If things just aren't running, or sitting in the task manager but never coming up, try removing your user files to see if that's the issue. If that fails it may be time for a system checkup to make sure it's not a problem with something else on your computer. If you have deleted your thumbnails, and the new ones are regenerated blurry, crunchy, or corrupted, you may have a problem. Blurry and crunchy thumbnails can often be a sign of a low-powered graphics card that is becoming over-strained. For more information on graphics cards, including identifying what type you have, finding out if it's a good one, updating graphics drivers, how to reduce/minimize strain, and more, see Game Help:Graphics Cards. This page was last modified on 30 December 2012, at 19:01. This page has been accessed 191,165 times.